This entry was posted in Tax Treatment On Financial Products, Trader Tax and tagged 1256, qualify on October 2, 2014 by Robert Green. Join Green NFH CPAs Robert Green and Darren Neuschwander in this Webinar. Business Expenses — they are far better than investment expenses. How to Qualify — it’s nuanced and our golden rules help. Employee-Benefit Plans — deduct retirement plans and health insurance premiums. This entry was posted in Trader Tax and tagged business, qualify, Section 475, TTS on September 20, 2014 by Robert Green. This entry was posted in Uncategorized and tagged qualify, TTS on August 27, 2014 by Robert Green. Green’s 2019 Trader Tax Guide focuses on traders’ unique tax needs. Our 2019 guide includes our latest thoughts, tax strategies, pitfalls, tweaks, warnings, and benefits. The 2017 Tax Cuts and Jobs Act (TCJA) ushered in significant changes, and many of them impact investors, traders and investment managers. During 2018, the IRS issued several proposed and final regulations, 2018 tax forms and instructions, and other guidance. Some essential questions remain open, and our 2019 guide provides the critical insight you need to proceed with tax preparation and planning. Whether you self-prepare your tax returns or engage a CPA firm, this guide can help you through the process and save you thousands and thousands of dollars. 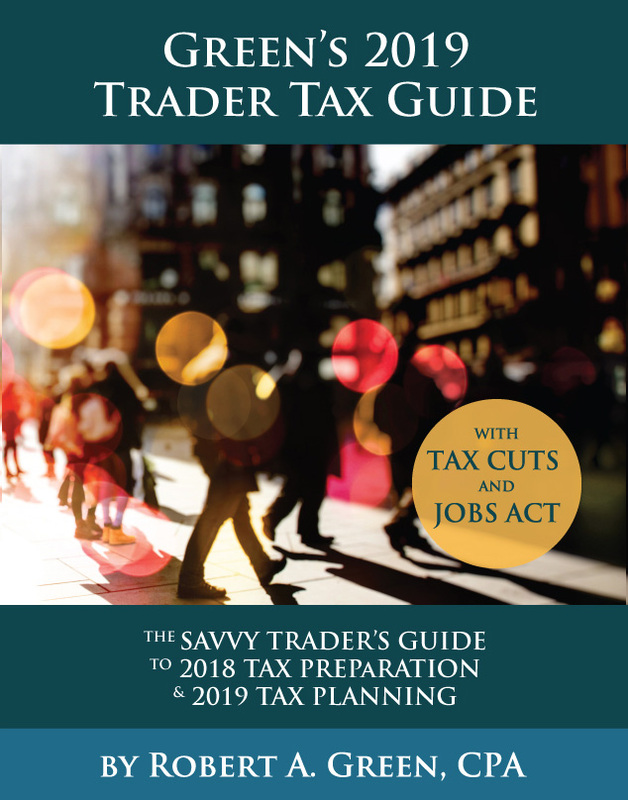 We’ve published our updated trader tax guide every year since 1997, and it remains the gold standard in trader tax. Our motto is be smart, creative, forward-thinking, cutting-edge, and even a bit aggressive, but keep it entirely legal. You deserve excellence in content, ideas, judgment, and decision-making. This entry was posted in Uncategorized and tagged 988, entities, IRS, planning, qualify, retirement, Section 475, TTG, TTS on August 12, 2014 by jparasole. Alert. In a recent tax exam, an Arizona agent applied federal hobby-loss rules to trader tax status incorrectly. See how we protested this below. We seek to win in the appeals process. If your home state or the IRS tries to apply the hobby-loss rules to your trading business, use these arguments to defend your position. Also see Jan 11, 2011 – Arguments to use in IRS exams, appeals and tax court. This protest letter was provided free of charge by our Traders Association. Please read our plea to join us below. The Arizona auditor applied federal hobby-loss rules (Section 183) and “trader in securities” rules from IRS Publication 550 Chapter 4 incorrectly. Arizona does not decouple from federal law on Section 183 or “trader in securities” rules. Therefore, the federal treatment on this issue governs. Section 183(d) gives a taxpayer a presumption of profit intent if his gross income from an activity exceeds the deductions from the activity for at least three taxable years out of five ending with the relevant taxable year. However, this is just a presumption. The actual test is whether or not the taxpayer conducts the activity with a profit motive, irrespective of the number of years of profit. Regulation section 1.183-2(b) states “In determining whether an activity is engaged in for profit, all facts and circumstances with respect to the activity are to be taken into account.” The regulation goes on to list nine different factors. Even if a taxpayer does not clearly fulfill many of the factors, a profit motivation may be indicated where an activity lacks any appeal other than profit; i.e., the absence of any personal or recreational motives is a factor indicating that the taxpayer had a profit objective. As Currie v. Comr., 28 T.C.M. 12, 21 (1969) noted, “there is nothing aesthetic or pleasant about thousands of decaying apples on a 10-acre farm.” Similarly, the tax court commented that “the need for the skeptic eye cast on hobby cases” is not present if there are no personal elements in the activity. Cohen Est. v. Comr., 29 T.C.M. 1221, 1228 n. 9 (1970). Trading, as opposed to horse breeding or gentleman-farming, is almost by definition an activity engaged in for profit, not recreation. There are no personal elements in the activity of trading. “The following facts and circumstances should be considered in determining if your activity is a securities trading business. • Typical holding periods for securities bought and sold. • The frequency and dollar amount of your trades during the year. • The extent to which you pursue the activity to produce income for a livelihood. The taxpayer meets these factors as a trader in securities. We covered this clearly in our tax return footnotes. We have shown the taxpayer’s intention to make a business profit and the agent never went through the detailed hobby-loss audit procedures that federal agents must use in an exam. In the few cases the IRS has raised the hobby-loss rules for traders, they have always agreed with us that these rules do not apply to trading businesses. The Traders Association prepared the protest letter above for this client to use in the exam. The Arizona tax bill for the proposed tax changes in this exam was only $400. The taxpayer figured the bill was materially smaller than the costs of protesting, especially if he used professional help – which we do recommend. This frames the problem for traders around the country. Traders get embroiled in tax exams and they may capitulate to the IRS and/or state on their findings, perhaps because the tax bill is low enough so its not worth the extra effort and cost to fight the matter. Although tax exams do not set legal precedent, as tax court cases do, allowing state and IRS agents to deny trader tax status serves to undermine that important tax status for all traders nationwide. Our Traders Association believes that we must contest any IRS and state agent on any level, including exam, appeals and tax court. Plus, we continue to communicate our thinking to Congress, the administration and other legislators. Conceding issues to the IRS or states can come back to haunt you too, if it expands exam years or broadens the changes to other parts of your tax return. Note that the IRS and states communicate their changes to each other too, so the tax bill can grow. Penalties and interest can make things much worse than they may first appear as well. It’s important to nip these problems in the bud. Please join our Traders Association to help us continue to do pro-bono work for traders around the country – when they need our help and either can’t afford our fees, or our fees are higher than their tax bills. We use membership dollars to help cover the costs of these pro-bono services. The trading community needs to stick together to defend trader tax status, fight off financial transaction taxes and user fees and not let regulators put undue burdens on trading. This entry was posted in Tax Exams, Appeals and Tax Court and tagged IRS, qualify on February 17, 2011 by Robert Green.